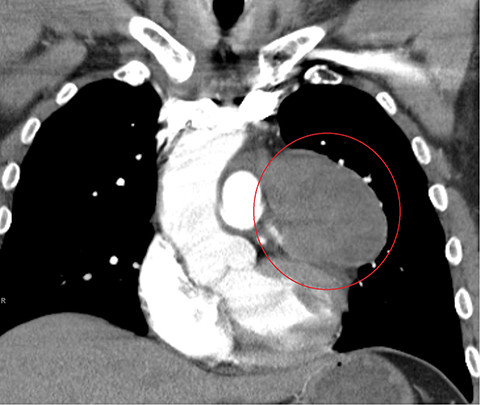 A 57-year-old male singer with no significant past medical history, who presented to the emergency room with pleuritic chest pain with extreme deep breathing, first noticed while performing on stage. Physical examination was unremarkable. Patient vitals were within normal limits with a pulse oximetry of 93 percent on room air. Labs were as follows: WBC 39.1, H/H 9.9/30.8, Platelets 395. All other lab values including electrolytes were within normal limits. 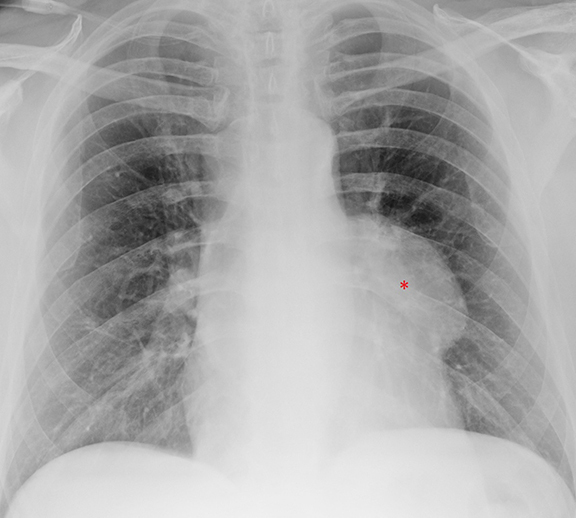 A chest radiograph (Figure 1) demonstrated an abnormal left sided mediastinal contour suggestive of a mediastinal mass (*). The lungs were unremarkable. 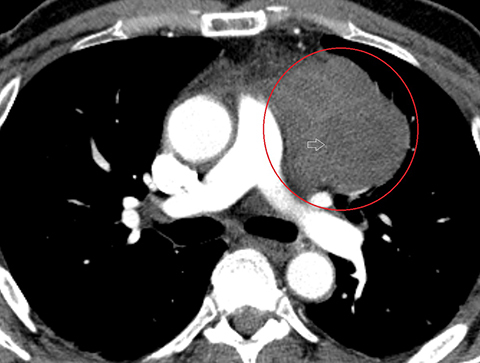 A CTA of the chest (Figure 2) demonstrated a large anterior mediastinal mass (O) with internal heterogeneity suggestive of necrosis (white arrow). 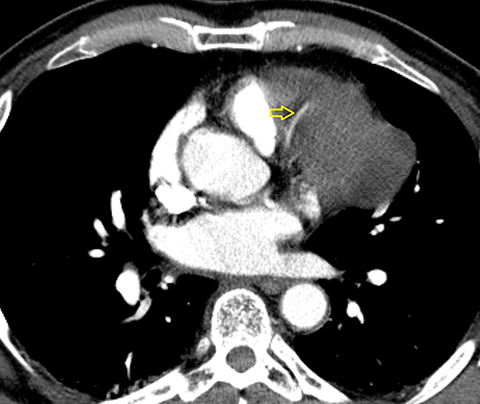 The left anterior descending artery was seen to traverse the mass without resultant arterial narrowing (yellow arrow). The remainder of the examination was unremarkable. 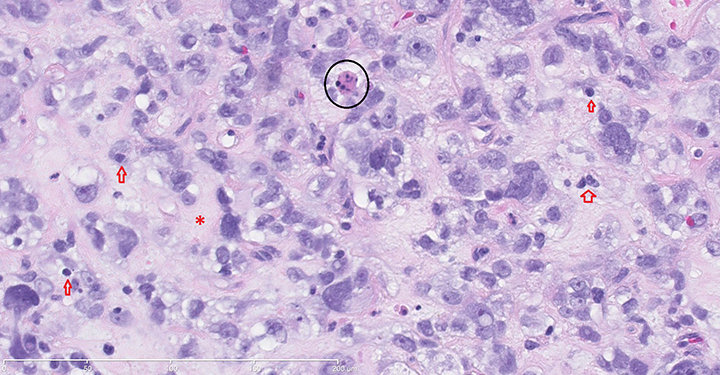 Pathologic samples (Figure 3) showed polygonal pleomorphic poorly differentiated myxoid cytoplasm with apoptosis and fibrous bands interwoven between tumor cells with extensive hyalinization positive for keratin, vimentin and p63. sided mediastinal contour suggestive of a mediastinal mass (*, Figure 4). 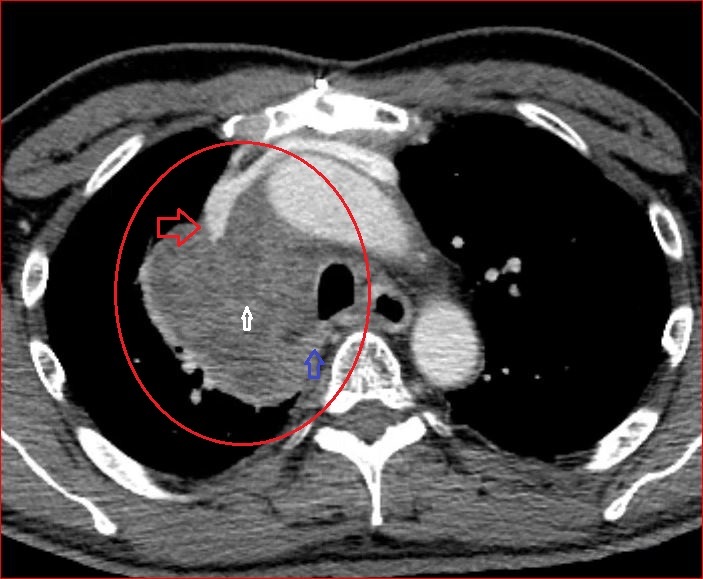 A CTA of the chest (Figure 5 demonstrated a large mediastinal mass (O) with extension into the posterior (blue arrow) mediastinal compartment, and internal heterogeneity suggestive of necrosis (white arrow). 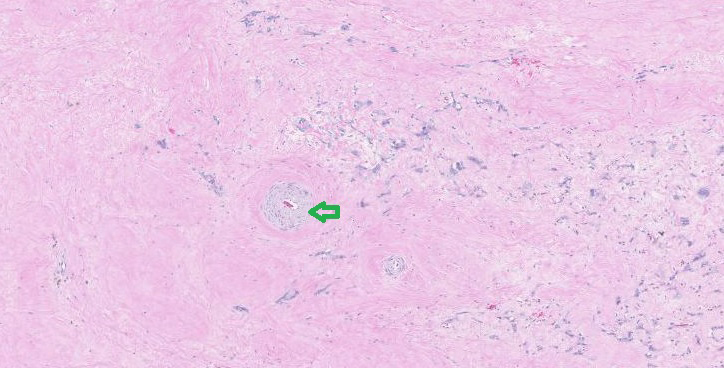 The mass partially encased the superior vena cava (red arrow) and extended into the epicardial fat (green arrow) with a large component involving the right atrioventricular groove surrounding the right coronary artery (orange arrow). 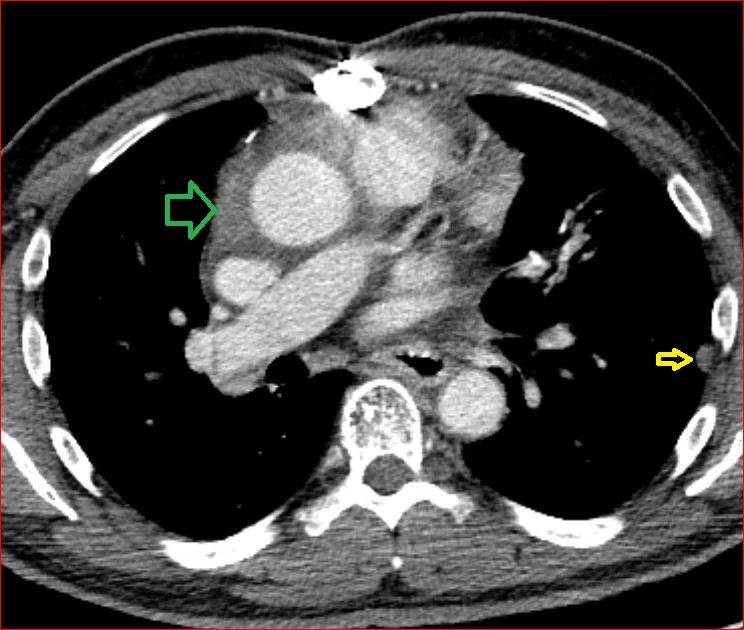 Pleural nodules on the left, which was the side of the initial tumor, were also present (yellow arrows). 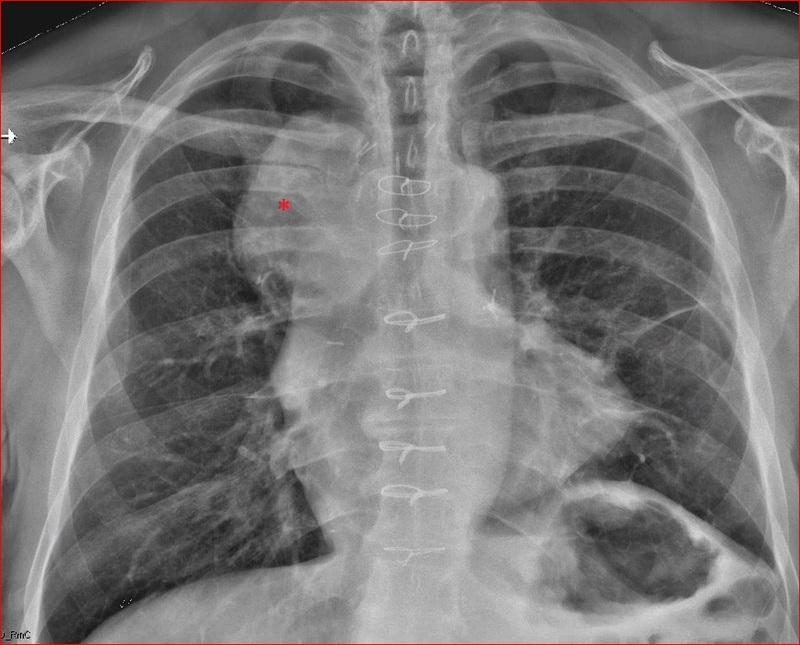 Pleural implants otherwise known as “drop metastases” can be seen in association with thymic carcinomas. Diaphragmatic elevation secondary to phrenic nerve palsy has also been reported.7Unfortunately, these findings can also be seen with thymomas, making histologic analysis pivotal to diagnosis. Thymic carcinomas are extremely rare tumors seldom seen in clinical practice. They are relentlessly progressive and invasive and thus recognition of the imaging and pathologic characteristics of these tumors is critical for diagnosis. Their highly aggressive nature and tendency for distant intrathoracic spread helps distinguish this entity from other masses. Given the limited number of cases in the literature, optimal management has yet to be determined. Multifaceted treatment with surgery, chemotherapy and radiation is the treatment of choice given the aggressiveness of this disease. Engels EA, Pfeiffer RM. Malignant thymoma in the United States: Demographic patterns in incidence and associations with subsequent malignancies. Int J Cancer. 2003;105(4):54651. Maghbool, Maryam, et al. Primary adenocarcinoma of the thymus: an immunohistochemical and molecular study with review of the literature. BMC Clinical Pathology. 2013;13(1):17. Tada Y, et al. A case of thymic carcinoma producing granulocyte colony-stimulating factor. Nihon Kokyuki Gakkai Zasshi. 1998;36(12):1043-1047. Suzuki, et al. Interleukin-6producing undifferentiated thymic carcinoma with neuroendocrine features. Lung Cancer. 2009;63(3):425-429. Bogot NR, Quint LE. Imaging of thymic disorders. Cancer Imaging. 2005;5(1):139-149. 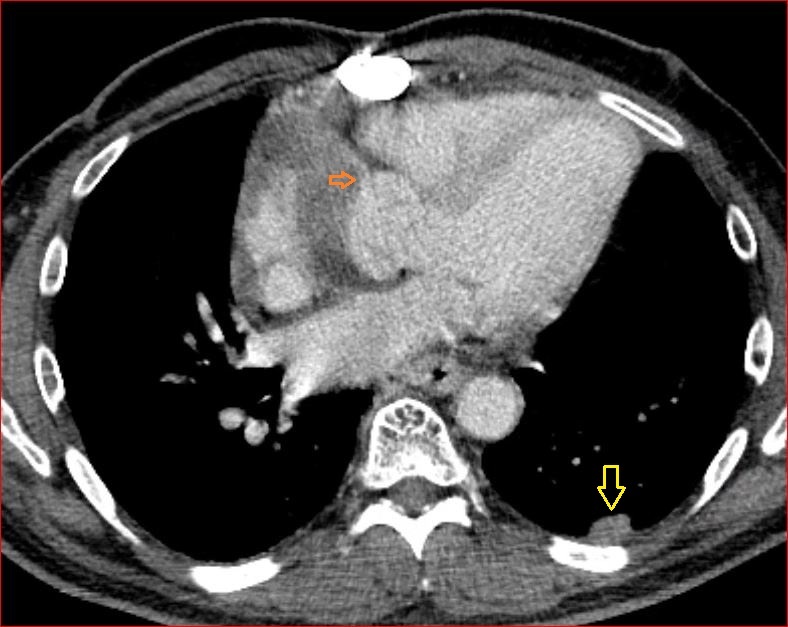 Juanpere S, Canete N, Ortuno P, et al A diagnostic approach to the mediastinal masses. Insights Into Imaging. 2013;4(1):29-52. Jung KJ, Lee KS, Han J, et al. Malignant thymic epithelial tumors: CT-pathologic correlation. AJR. 2001;176:433-439. Pomplun S, Wotherspoon AC, Shah G, et al. Immunohistochemical markers in the differentiation of thymic and pulmonary neoplasms. Histopathology. 2002;40:152-158. Eng TY, Fuller CD, Jagirdar J, et al. Thymic carcinoma: state of the art review. Int J Radiat Oncol Biol Phys. 2004;59(3):654-664. Stavrakis C, Rand J, Fabian T, Fantauzzi J. Thymic carcinoma. Appl Radiol. 2016;45(2):38-40. Prepared by Dr. Stavrakis while a Radiology Resident R2, Dr. Rand while a Pathology Resident, Dr. Fabian while a Cardiothoracic Surgeon, and Dr. Fantauzzi while a Thoracic Radiologist at Albany Medical Center, Albany, N.Y.